Let me just tell y’all after what I saw today, I am afraid. And you all should be very, very afraid. Tomorrow the Big One is four years old. Scary to think that she is four already. Even scarier to think that someday this four-year-old will want to get a driver’s license and drive a car for real. 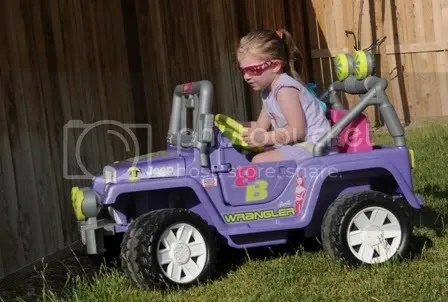 For her birthday, she got a Barbie Jammin’ Jeep. And let me tell you, trying to teach this child to drive the thing was quite an adventure. Fortunately we have it set to the “turtle mode” versus the “hare mode.” So when she crashed into the fence, patio table, Little Tikes picnic table and several other backyard toys, there was no permanent damage. Likewise, I think the sprinklers will be okay too ( I’ll find out tonight when they turn on!). My big toe has stopped throbbing and bleeding but it is still a bit sore. She is already a typical teenage driver – she was turning the radio dial, fixing her sunglasses and looking everywhere except the “road” in front of her. In her defense the Little One did knock the lever and switch the car into reverse a couple times. But the Big One was still a bit erratic on the road. The fence closing is in on them! And she was also exhibiting some signs of road rage. As she was about to crash into the fence, she screamed and cried in frustration. She even smacked the steering wheel in anger because she couldn’t get the wheel to turn. All the while, she kept her foot on the accelerator therefore ensuring the collision would occur. I kept trying to explain to her that if she felt like she was going to crash, she needed to take her foot off the pedal first. Then we’d get the Jeep turned the right way. That whole concept was a bit much for her four-year-old brain. My boys have a four wheeler Power wheels that they got last year, and it does get better they learn more how to maneuver and what things they can make it around. Connor started out in the turtle speed and this year he can drive comfortably in the Rabbit speed. They have lots of fun on that thing and it is huge so even the adults can ride it sometimes. However Paul will be handling the driving lessons at this house too when it comes to a car I am not sure I have enough Patience lol! Kind of off topic – but how do you guys like the jeep as far as size? 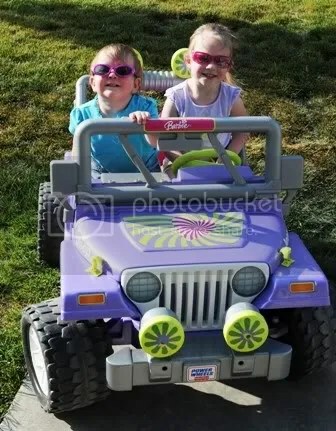 Our jeep that was supposedly a two seater never was big enough, that was a joke really, but Joe now wants to get them each a power wheels (my grandfather was looking at getting them each one before he died) but not finding ‘the right one’. Bridget~ Right now it’s great for them. But I can see that in another year it might be a tight squeeze for the two on them.